Second stop on holiday– Bilbao, Spain. I have to say I was disappointed. I was very excited to go into Spain and although Bilbao had fabulous things to offer like the Guggenheim, it is definitely a city that only needs a day to see. To give Bilbao the benefit of the doubt, we were there Wednesday and Thursday. Being the middle of the week, and many residents being on holiday, I could understand a slight lack of people. However, this place was like a ghost town. First of all, when we arrived we had to go on the journey of finding our hostel that was described as close to the Guggenheim, which apparently translates to 20 minute walk away. From the bus station we started toward the direction of our hostel. We found ourselves among car repair shops and industrial stores. The hostel, Bilbao Akelarre Hostel, did have good qualities such as the friendly staff and cleanliness, however, the location and the vibe did not work for us. There was a much older crowd, (and anti-social I might add) than typical for hostels–I’m talking 40 and 50 year olds. This is kind of rare to see in the hostel world. Because of the social butterflies we are, Callie and I were looking forward to meeting new people. This is why we gave up on the people at the hostel and attempted to go out that night… I will get back to this later. For now, I will continue on my day. After settling in at the hostel, we walked over to the Museo de Bella Artes de Bilbao because Callie had found that they were doing a free exhibit on Balenciaga. Balenciaga is a famous fashion designer who was born in Basque Country. He is known for his bubble skirt; his feminine but ultra-modern style; and his use of innovative fabrics. The exhibit had 35 of his pieces. I have never seen a fashion exhibit so I really enjoyed getting the chance to see such a fashion genius’ work. When we were finished at the museum, we walked around a bit but of course, we were hungry and wanted to find some food! 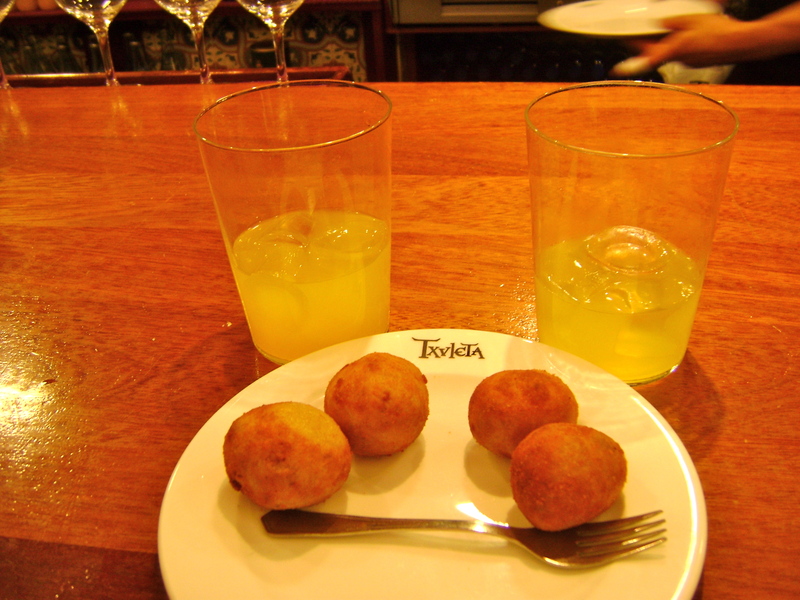 However, for those of you who have not been to Spain, you need to know about siestas. It’s this inconvenient time in the middle of the day for like 2 or 3 hours where everywhere closes. No shops. No food. No churches. No museums. Nothing. We were starving and basically out of luck. Oh but wait, there is a Telepizza open– just our luck. Hands down biggest waste of 8 euros and the worst meal I have eaten. This was the first major flaw of Bilbao! After being traumatized from that experience, we decided to go back to the hostel to get ready to go out in hopes of making more of this trip here. Me scared in the middle of a street in Bilbao because no one is around. We asked the staff were we should go out since we didn’t know much about Bilbao. She gave us a few places and we were on our way. Well, let me tell you, even with the help of someone who knows Bilbao, you are not going to find any fun. It legitimately was vacant. Nothing. No one. Callie and I behind the bar at Irish Stone! Frustrated and disappointed we decided to head to the street with Irish pubs near our hostel. We went to a place called Irish Stone, a Guinness bar. The awesome guy who ran the bar, (we called him Pechos), did not know what an Irish Car Bomb. So naturally, I felt it was my duty to teach a man who was running a Guinness bar who to do a “Bomba de Coche Irelandez.” He was impressed! He let Callie and I behind the bar and took a picture for his website. It is so easy to make friends when traveling! Pechos didn’t speak English and with our broken Spanish it made it pretty difficult to communicate with someone who speaks Basque. This is the beauty of the people you meet when you travel–finding common ground. I love it! While we were there we met a couple of guys who lived in Bilbao. They were nice, but again hard to communicate. Because Callie and I were complaining about who lame Bilbao was, they told us they were going to a party the next day. We didn’t know what to expect but if we could take the Metro there, we thought it sounded fun and somewhat safe. The next day, Callie and I decided to head to the Guggenheim Museum. Bilbao’s true gem! Because I absolutely loved the museum, I can’t write off Bilbao completely… just mostly. There was a featured artist there called Anish Kapoor. He is an Indian sculptor that studied in London. His work is abstract and he believes in “taking the artist out of the art” and leaving it to the viewer to figure what they believe the meaning is. Kapoor has simple, colorful, and monochromatic pieces varying immensely. I havent really ever seen artwork like his, and although it can definitely be considered weird, it made me think. I wish I had more pictures of his pieces but the few I had were taken illegally without the camera nazis at the museum seeing! When we finished at the museum, we went on a hunt for bread and cheese. I know what you are thinking: “you’re in Spain not France,” but come on, there are reasons for this. One, it gets expensive traveling and for two au pairs that make barely any money, a cheap meal sounds perfect. Two, yes we live in France. We headed to the Cathedral de Santiago after lunch only to find it closed. Again the Spaniards and their siesta. So H&M was a much better choice. On our way to getting more gelato before we made our journey to the Irish pub again, we saw these awesome street performers. When we finally made our way to the pub, we asked the guys we had met about the details and headed to Plentzia on the Metro. Plentzia is this little village right on the coast about 40 minutes from Bilbao. Apparently they were having a huge party for the whole village, (aka fiesta de popular). Callie and I were sold. When we arrived in Plentzia and immediately could see the crowds of people lining the streets in the distance. We crossed this gorgeous bridge and on the other side the fiesta awaited! On this one street there were 2 bars open on either side. At the end of the street was a section roped off for children to play, (which, towards the end of the night turned into a huge bubble party for kids). The streets were packed with people constantly going in and out of the bars. Music rang in the streets–a mix of popular American and Spanish tunes. Callie and I order a few… well several… vodkas with orange schwepps (which later we learned were called destornilladors from our new friend David, who happened to be a fifty year old guy wearing eye shadow). We had been told the Metro stopped at 11pm so although we were having the time of our life, we made sure we were at the station by then. Well someone lied. Luckily, these nice girls who could clearly tell we were confused told us the last bus was coming. After a few more adventures, we finally made it back to our hostel. A successful night!